Laleham Lea School has always been and remains an inclusive family at the heart of the local community. Our mission statement is at the heart of everything we do as the Laleham Lea family, both in and out of school life. Parents and Visitors are invited to attend our Masses at the John Fisher Chapel and our Christmas and Easter Concerts and School Production and prize Giving in the John Fisher Hall. Local experts are invited into school to give talks on a range of topics including Dentistry and How the Brain Works. Representatives from Laleham Lea take part in the annual Remembrance Service and Parade at at The Lord Roberts at Woodcote Green. 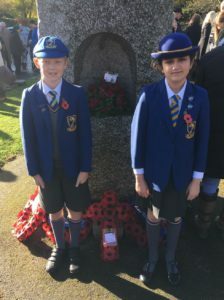 Two Year 6 pupils are chosen to attend the Memorial and lay a wreath on behalf of the school. Water Aid – Our chosen charity during Lent this year will be ‘Water Aid’s Jars of Change campaign’. 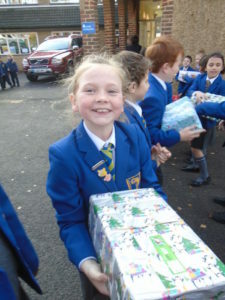 Pupils are being encouraged to give up something for Lent and donate the money they would have spent on that item to help others to have clean water. CAFOD’s ‘Give it up Campaign’ where children raised over £2000 to support families living in poverty abroad. 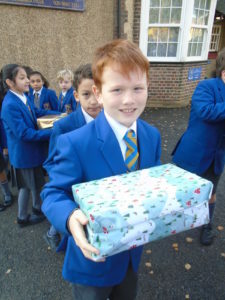 Operation Christmas Child – The Samaritans’ Christmas Shoe Box Appeal. 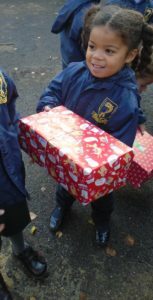 This year we collected over 105 boxes to be sent to children all over the world. 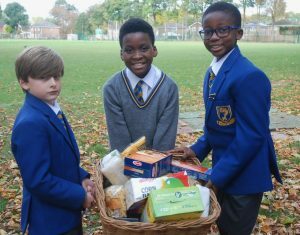 Purley Food Hub – In November we donated over 200 items to Purley Food Hub as part of our Harvest celebrations. Water Aid – Our cake sale raised almost £200 for charity Water Aid. A representative from Water Aid came into school to collect the cheque and tell the pupils all about the work they do and how their donations will help. The NSPCC visit school to work alongside our Students with assemblies and workshops as part of their Speak Out, Stay Safe Campaign; Pupils also raised over £1000 to support the charity. The Anaphylaxis Campaign visited school to deliver an assembly on allergies and reminded us of responsibilities to our friends and colleagues who may have allergies. We have close links with John Fisher school and enjoy the use of their Chapel for our Masses and Hall for our Summer Production and Prize Giving. 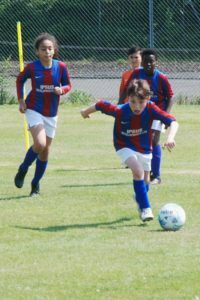 We also use the John Fisher field for Games lessons and Football Matches against other local teams. Father O’Gorman from John the Baptist visited school to officially open our ‘Buddy Bench’, which was created by our Student Council team. We work closely with St Marks Church, Purley and held our Christmas Carol concert and PTA Disco there last year. Many of our Pupils are members of the 25th Purley Beaver, Cubs and Scout groups which is based at St Marks. 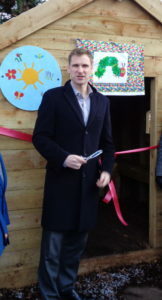 We welcomed M.P Chris Philp to officially open our Nature Trail which was designed and funded by our PTA. The Lord Mayor also paid a visit to the Laleham Lea to talk to our Student Council about the role of democracy and British Values. Our Year 5 Class paid a visit to Purley Sunrise Care Home in December to sing Christmas Carols for residents.